Ani Romero is one of eight zombie survivors of Prompocalypse. She and her fellow zombies are now learning chained to their desks and watched over by armed guards. Once they’re declared not human, only a court appeal keeps them alive waiting and hoping for a cure. Will it come in time and will it be all it was supposed to be? 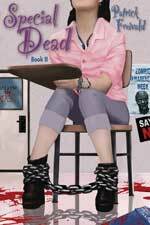 Special Dead is the second book in the Twice Shy series.